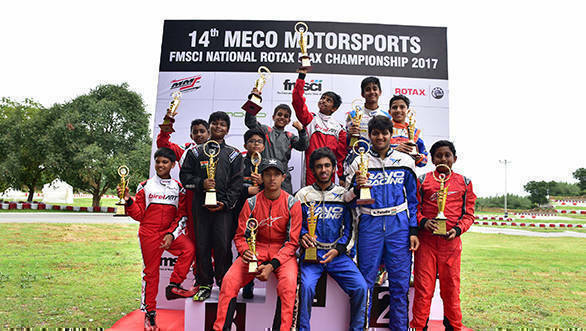 The second round of the FMSCI National Rotax Karting Championship was held in Hyderabad, and it was Mumbai's Aaroh Rabindra who emerged victorious in the Senior Max class. It was, however, Manav Sharma of BPC Racing who dominated the qualifying races and the pre-final races, but wasn't able to hold position in the final race. He was pipped by Aaroh Rabindra of Rayo Racing, who started second, but went on to win the race by 3.5 seconds. Aanjan Patodia, also of Rayo Racing, took second place, while Manav had to settle for third. The Junior Max final was won by BPC Racing's Chirag Ghorpade, who had a spirited battle with MSport drivers Yash Aradhya and Shahan Ali Mohsin, who finished second and third respectively. Meanwhile, in the Micro Max class, it was Peregrine Racing's Arjun Rajiv who won the final race, ahead of Birel Art duo Ruhaan Alva and MR Rishon.